The Whitla Wind Project was selected as one of four projects by the Alberta Electric System Operator (AESO) in Alberta’s first renewable energy auction, a competition that attracted global participation. The auction set a record breaking low cost benchmark for wind energy costs in Canada, and resulted in Alberta expanding its original wind MW allocation target nearly 50 percent, from 400 MW to nearly 600 MW. The 2017 auction is part of Alberta’s plan to add up to 5,000 MW of renewable energy to the grid by 2030. Alberta is the third largest wind market in Canada, which ranks 9th in the world for installed capacity. Wind has been the number one source of new electricity generation in Canada for more than a decade. 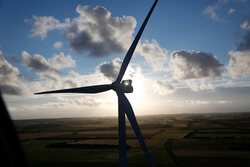 “We’re pleased that Vestas’ 4 MW platform was able to help Capital Power achieve the record-breaking low wind costs in this auction, which are a testament to the power of wind to deliver clean, low-cost energy for the benefit of consumers and communities”, said Chris Brown, President of Vestas’ sales and service division in the United States and Canada. The order includes supply and commissioning of the turbines as well as a ten-year Active Output Management 5000 (AOM 5000) service agreement, designed to maximize uptime and energy production and ensure optimized performance for the lifetime of the project. Turbine delivery will begin in the second quarter of 2019 with commissioning scheduled for the third quarter.